Fayetteville traces its roots to 1755, when John Newberry, a millwright and Quaker immigrant from Pennsylvania, acquired more than 1,400 acres-nearly all of modern-day downtown Fayetteville-in the Upper Cape Fear region and built an overshot waterwheel gristmill on Cross Creek. 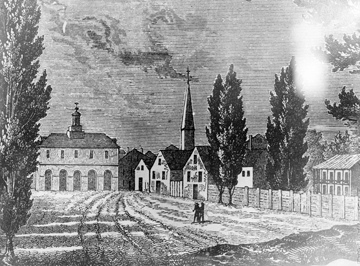 In the early 1760s the settlement at Cross Creek experienced its first real estate boom. Newberry sold lots for homes, stores, mills, taverns, shops, a tanyard, and a brewery, and by 1762 Cross Creek was a well-established commercial center, although the county courthouse was established in the town of Campbellton, a mile away on the Cape Fear River. During the American Revolution, except for a few months during the bloody Loyalist-Patriot civil war of 1781-82, Cross Creek was firmly in Patriot hands, serving as a supply depot and occasional military outpost guarding the Cape Fear River Valley against British excursions from Wilmington. For two days in March 1781, Lord Charles Cornwallis's British army, retreating from the Battle of Guilford Courthouse, camped in the village. After the war, leaders in the growing settlement of Cross Creek hoped for it to become the capital of North Carolina. In 1783 a committee of the state legislature laid out the previously unplanned village with straight streets and squares and renamed it Fayetteville, the first place in North America named in honor of the Marquis de Lafayette, the young French nobleman who fought for American independence. 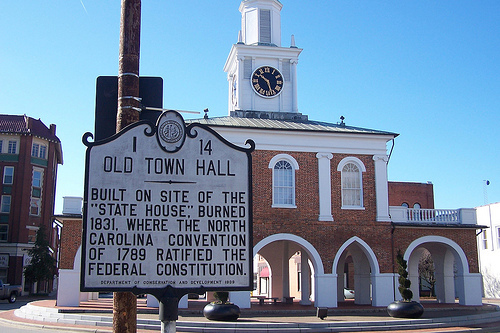 Fayetteville was not destined to become North Carolina's capital, but in 1789 it was host to the Constitutional Convention that ratified the U.S. Constitution and to a legislative session that chartered the University of North Carolina. For the next 40 years, Fayetteville was the largest inland town in North Carolina. Trade-with goods moving in steamboats along the Cape Fear-was attracted to the town by textile and sawmill operations, stores, taverns, and comfortable inns and hotels. In the 1840s the federal government paid for a handsome military storage armory on Haymount, overlooking the town. During the Civil War, the armory built by the federal government became a gun factory for the Confederate army. In the last days of the war, soldiers of Gen. William T. Sherman's Union army knocked down the armory and burned the offices of the Fayetteville Observer. In the decades following the Civil War, while some other North Carolina towns grew into small cities, Fayetteville did not. In the 1890s railroad lines finally connected Fayetteville with distant places and brought renewed prosperity and growth. Textile factories, sawmills, and turpentine distilleries added economic muscle. In 1918, during the last months of World War I, in what would prove a defining event for Fayetteville, the U.S. Army acquired more than 100,000 acres of nearby pine woods and farmland and established an installation called Camp Bragg. Renamed Fort Bragg, the post was, for its first 20 years, the home of artillery units and Air Corps planes stationed at Pope Field. In 1940, with war breaking out in Europe, another momentous change occurred: Fort Bragg was enlarged to become the country's largest army training post, and Fayetteville's civilian population grew as a consequence. During World War II, hundreds of thousands of soldiers passed through Fort Bragg on their way to world battlefronts. During the Korean and Vietnam Wars, the post once again became a center for mobilization. The post population reached more than 45,000 soldiers and airmen during the Korean War and has remained constant since. The wartime booms transformed Fayetteville from a small textile-and-sawmill town to a bustling commercial city. In the 1960s the city attracted new civilian industries making plastics, tires, auto parts, and appliances. Its airport was modernized for more scheduled flights. Retailing and tourist businesses proliferated. By 1970 residential subdivisions sprawled across miles of former cotton fields and pinewoods in a circle around Fayetteville. In the 1970s this suburban growth spurred expansion of retailing into big shopping malls, and by 1980 the mall area near the nineteenth-century McPherson Presbyterian Church ranked among the state's largest retail locations. Population growth and economic development triggered expansion of health care facilities, public schools, cultural opportunities, modern commuter roads, and the campuses of Fayetteville State University, Fayetteville Technical Community College, and Methodist College, a two-year institution that opened in 1960. In the 1990s this proliferation was capped by the opening of the 12,000-seat Crown Coliseum, a first-class venue for indoor sports and entertainment. Other popular attractions in Fayetteville are the Museum of the Cape Fear, the Airborne and Special Operations Museum, and the Fayetteville Museum of Art. Fayetteville in 2005 was North Carolina's sixth-largest city, with a population approaching 150,000. John A. Oates, The Story of Fayetteville (1950). "Old Town Hall." NC Highway Historical Marker I-14, NC Office of Archives & History: http://www.ncmarkers.com/Markers.aspx?sp=Markers&k=Markers&sv=I-14. Search results for Fayetteville > Fayetteville (Cumberland County, N.c.), North Carolina Digital Collections, NC Department of Cultural Resources. "Fayetteville, NC, drawing of old Market House, no date." From the North Carolina Conservation and Development Department, Travel and Tourism Division photo files. North Carolina State Archives, call #: ConDev2409C. Available from http://www.flickr.com/photos/north-carolina-state-archives/4155397851/ (accessed December 3, 2012). Conn, J.Stephen. "Old Town Hall Historical Marker." February 5, 2009. Available from: Flickr Commons, http://www.flickr.com/photos/jstephenconn/3908622566/ (accessed December 3, 2012).